The Homewood Suites by Hilton Bloomington IN hotel in Indiana is located conveniently off of SR 37 and IN 45 on the west side of Bloomington with easy access to Indiana University downtown Bloomington and the Bloomington Technology Park. Our Bloomington Homewood Suites by Hilton hotel has 82 spacious suites and offers all the comforts of home. Our suites are designed with comfortable accommodations for both business and leisure Indiana travelers staying for a few days or a few weeks. All hotel suites feature fully-equipped kitchens with a refrigerator microwave two-burner stove top dishwasher and a dining table large enough for work. Our Bloomington hotel also offers complimentary high-speed internet access speaker phone and voicemail. Indiana travelers will enjoy our complimentary hot breakfast buffet served daily featuring eggs bacon sausage fruits cereals and homemade Belgian waffles. We invite you to be our guest Monday through Thursday for our Welcome Home Reception where Bloomington hotel guests enjoy a light meal salad bar and beverages including beer and wine. While staying at the Homewood Suites by Hilton guests can relax in our indoor pool and spa or workout in our fitness center. 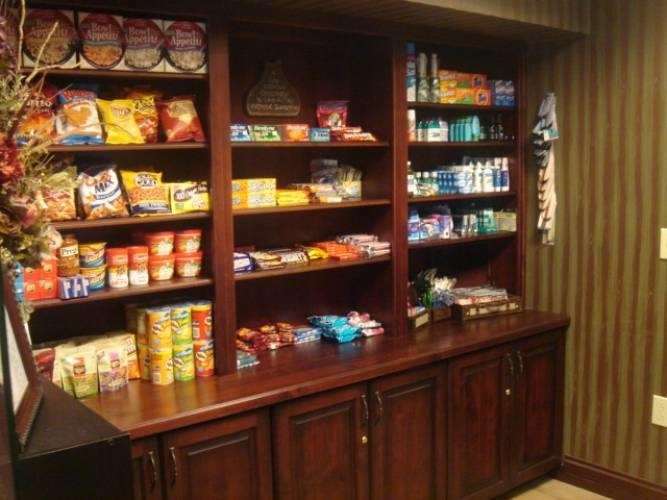 For your convenience we also offer a business center on-site laundry facility complimentary grocery shopping service and 24-hour Suite Shop. Make yourself at home when you stay at our upscale all-suite Homewood Suites by Hilton hotel while in Bloomington Indiana. Scholars Inn Gourmet Cafe: Lunch dinner late night deserts and Sunday Brunch served. Grazie. Italian Eatery: Grazie is a fun casual Italian restaurant where food is made fresh using authentic Italian cooking methods. Irish Lion: This pub offers a true taste of Ireland in a friendly 1800*s pub atmosphere. Restaurant Tallent: Restaurant Tallent is a unique culinary experience combining fresh local organic ingredients specialty wines and superior service. Crane Naval Surface Warfare Ctr.